Object : Specific programmable controller for the control of self-reset of circuit breakers and switches. In the case this PLC controls a circuit-breaker self-reset, as soon as the voltage is out, the PLC will generate a remote reset signal taking into account the context and/or the programmed delay time. 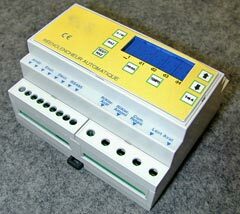 * on the sides : screw terminals for the connection to local voltage supply, remote control signals, alarms, serial and output connections of reset control (or connection with the 4 channel extension box for the multi-channel optional device). * In case of an extension, + 3 inputs for voltage reading. * In case of extension, + 3 relays outputs. * 1 RS485 for programming and remote control.